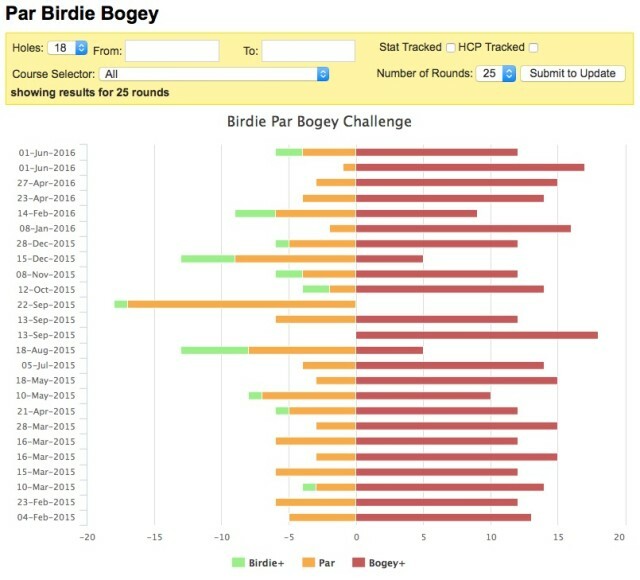 For anyone taking part in our Birdie Blitz challenge or just looking to increase the number of pars and birdies per round then the Golfshake Score Tracker provides a great way to track and benchmark your game. We've been tracking scores for over 10 years with nearly 3 million rounds tracked online using the Score Tracker and our research shows that golfers who actively track their scores & stats on average can reduce their golf handicap by 3 shots over a year. The Golfshake Golf Score Tracker will track unlimited rounds for multiple course whilst maintaining your golf handicap and playing level as well as provide access to some stats, analysis and reports. For any golfers looking to improve their game or take part in the Golfshake Birdie Blitze the Score Tracker provides some fantastic tools to benchmark your game, get inside your sites and focus on scoring more pars and birdies! If you regularly play the same course have you had a birdie on every hole ? Simply track your scores via the Score Tracker and the system will provide an enhanced eclectic score card showing; your best score per hole, worst score per hole, hole averages, recent rounds plus the Birdie Challenge - recording a round on every hole - and the Par Marker. This report will provide a snapshot of your recent rounds showing the number of birdies, pars and bogeys to help you focus your game and get on the par or birdie trail. Finally, members are also able to set goals & targets to help them on their quest to become better golfers. As well as setting score, stat & putting targets the system also allows goals specifically for Pars Made and Birdie Chance Converted and the system will also provide your benchmark handicap level for these particularly stats. For anyone looking to improve their game or know where their strenghts and weaknesses lie then the Golfshake Score Tracker can be a fun and useful tool to use as well as being an invaluable tool in benchmarking stats for any golfer wanting to lower their golf handicap.